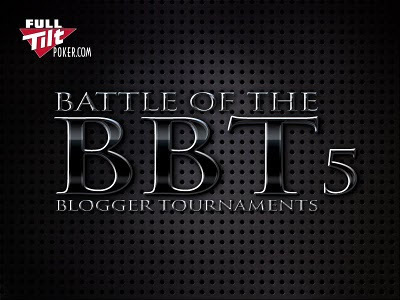 The BBT5 will last six weeks, culminating in a Tournaments of Champions scheduled for Thursday, May 27th. The prizepool for the ToC is impressive: 1st, 2nd, and 3rd place finishers will each receive a $10,000 entry into the 2010 World Series of Poker Main Event as well as room accommodations at the Rio All-Suites Hotel and Casino. 4th and 5th place finishers will receive a $2,000 Bracelet Race package good for many of the preliminary 2010 WSOP events. In order to fulfill the egalitarian promise of the Battle Royale, we’ll also accept good-faith gestures from bloggers who would like to play in the Battle Royale but cannot, for whatever reason, meet the above qualifications. Email Dave McCarthy at DaveFromTheRail@gmail.com and he’ll take care of your Battle Royale entry in exchange for a little assistance promoting your fellow bloggers.